I love downtown Joburg. Everyone knows this. I am constantly singing the inner city’s praises and defending it against detractors. 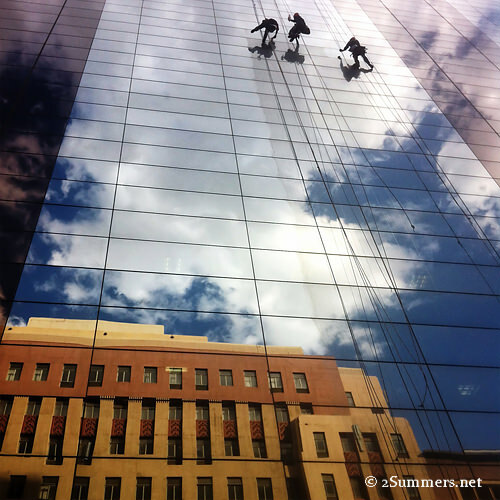 I visit the inner city as often as possible and I love discovering fun things to do there. 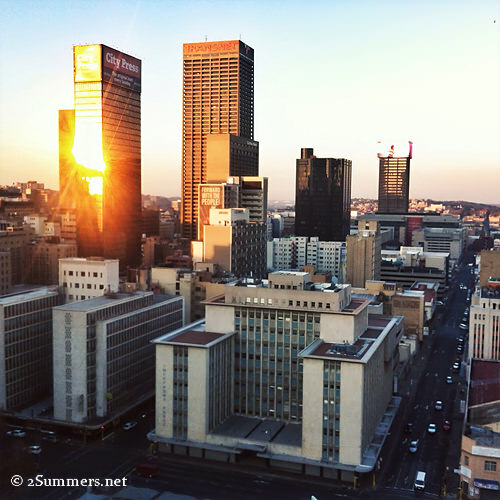 Downtown Jozi at its best, viewed at sunset from the top of the Lister Building on Jeppe Street. Imagine my excitement when I learned there will be an entire week-long festival devoted to having fun in downtown Jozi, and that I would be involved in helping promote this festival to the world. The first-ever Joburg City Festival starts on 25 August (that’s right — next weekend!) and runs through 31 August. It’s a pretty novel concept. 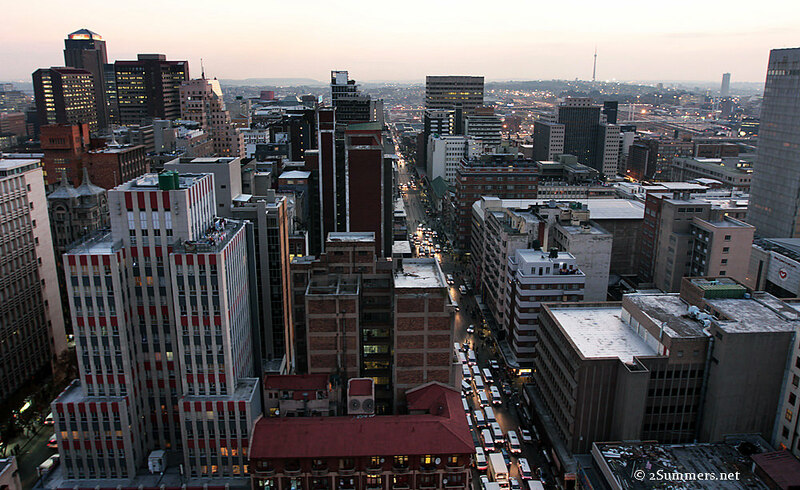 The festival is organized by the Joburg City Tourism Association (JCTA), but is made up entirely of events hosted by JCTA members: restaurants, hotels, theaters, museums, entertainment venues, tour companies, and other businesses operating in Joburg’s inner city. This loose, grass-roots-level organization has encouraged a quirky, diverse lineup of events that is perfect for Jozi. Programme for the Joburg City Festival. Amazing, yet slightly overwhelming. 1) Download the festival programme (pictured above) using this link. Print the programme, if possible, or keep an eye out around town for one of the handy printed programmes. 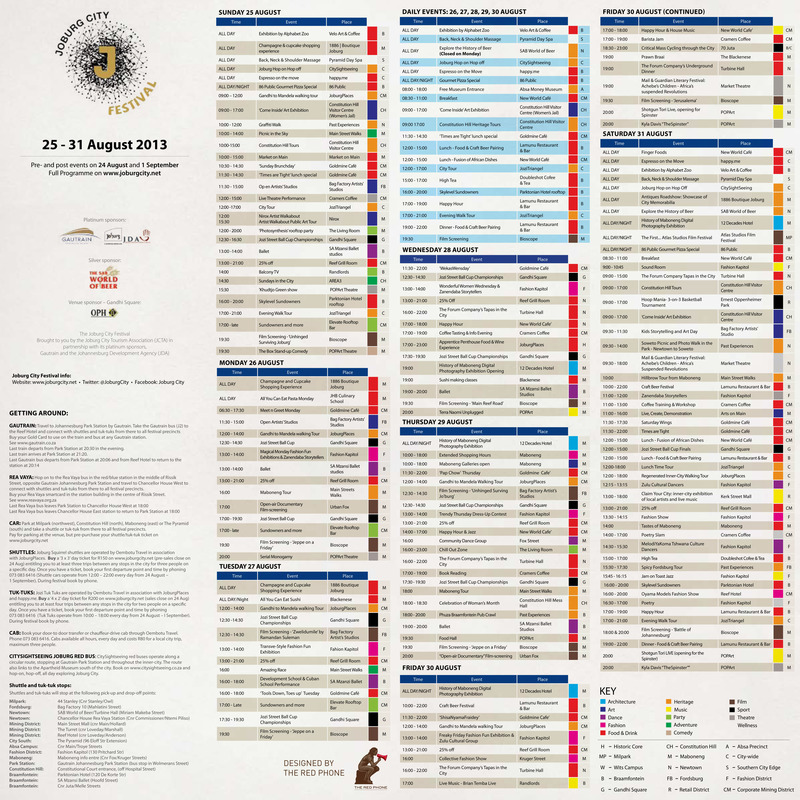 The printed programme has all of the festival events printed on one side and a user-friendly Gautrain rail and bus map on the other. You can pick up a copy of the programme at the JCTA offices in the Turret, at the corner of Marshall and Loveday Streets. Jozi Street Ball Cup Championships in Gandhi Square. Street soccer in Gandhi Square, right in the heart of downtown Joburg, every day of the festival except 30 August. There is no way that this won’t be awesome. Follow the event on Facebook and Twitter for updates. Champagne and Cupcake Shopping Experience at the brand-new 1886 Boutique Joburg shop in the Maboneng Precinct. I don’t know exactly what this event comprises but I like the sound of it. It’s running all day on 25, 26, and 27 August. “Balcony TV Johannesburg” live music performance at Randlords in Braamfontein, 25 August. Join the event on Facebook. Jeremy Loops is playing, and if you read my Oppi Koppi post last year then you know how I feel about Jeremy Loops. Also, Randlords has one of the most amazing skyline views in town. All of the events at the South African Mzansi Ballet and the Fashion Kapitol. There is something on at each place nearly every day of the festival. Apprentice Penthouse Food and Wine Experience, hosted by JoburgPlaces, on 28 August. I visited the Apprentice Penthouse during the Joburg City Media Weekend and it’s one of the most luxurious spots in downtown Jozi. Booking details are on the JoburgPlaces website. Phuza Braamfontein Pub Crawl, by Past Experiences, on 29 August. Self-explanatory. ‘Nuff said. Details on Facebook. Barista Jam at Cramers Coffee on Main Street, 30 August. Baristas from all over town competing on who can whip up the best coffee foam. What could be better? Claim Your City inner-city exhibition of local artists and and live music on the Kerk Street Mall (the best shopping street in downtown Jozi), 31 August. Craft Beer Festival at Lamunu Restaurant and Bar in Braamfontein, 24, 30, and 31 August. Once again, ’nuff said. This photo doesn’t really have anything to do with the festival. But I shot it downtown and I’ve been looking for an excuse to use it. 3) Once you’ve identified the events you want to attend, visit www.joburgcity.net and look up the events on the detailed daily programme schedules. Links to each day’s detailed programmes are here. Booking details for each event are available on these pages. Note that some events are free and don’t require pre-booking, while other events cost money and must be booked in advance. 4) Head downtown and have a great time. Skyline view from the Reef Hotel, site of several Joburg City Festival events. Speaking of heading downtown, here are a few tips on transportation. The best modes of transport to get INTO the city are: 1) Take the Gautrain to Park Station, catch the J2 bus to the Reef Hotel, and catch local festival transport from there; or 2) drive to one of several centralized parking areas around town and catch local festival transport from there. Find details on the Festival Transport page. Once you’re in the city, the best modes of transport are: 1) the Rea Vaya buses; or 2) dedicated local shuttles and tuk-tuks. JCTA has organized a special network of shuttles and tuk-tuks, running between all of the major festival venues, specifically for the festival. Details and instructions on how to purchase shuttle/tuk-tuk tickets are here. 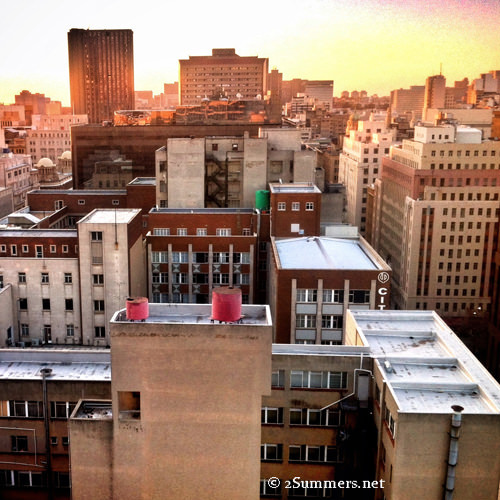 One more pretty downtown Jozi picture. I have lots. I’ll continue to provide festival updates when appropriate. In the meantime, follow @JoburgCity on Twitter (also check out the #JoburgCityFest Twitter hashtag) and on Facebook. Rest up this week because next weekend and the whole week following are going to be epic. Wish I could attend, Heather. Looks like tons of fun. I was going to say I loved the first photo, but when I saw t he others, it was impossible to pick. Great images! Thanks Kathy! Hope you’re doing well. After 22 years of living in Gauteng JHB rare were the times when I ventured into downtown JHB due to the fact that its not very safe. As a woman I personally would not go downtown alone. I no longer live in SA. Thanks for the comment, Alma. I appreciate your honesty. For what it’s worth, I’m in downtown Joburg several times a week and have never had a problem. I think most parts of the CBD are just as safe, if not safer, than pretty much anywhere else in the city.